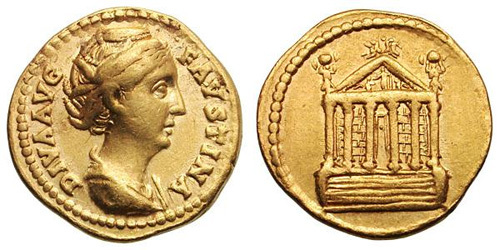 Annia Galeria Faustina, commonly distinguished as Faustina Senior, the wife of Antoninus Pius, died in the third year of his reign, A.D. 141 and was consecrated by Antoninus who issued a very large commemorative coinage in her honour. 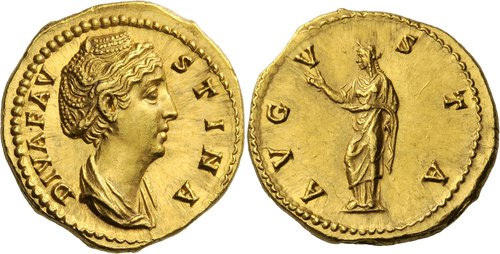 Obverse: FAVSTINA AVG ANTONINI AVG P P, Bust, draped, right, hair elaborately waved in several loops round head and then drawn up and coiled on top. 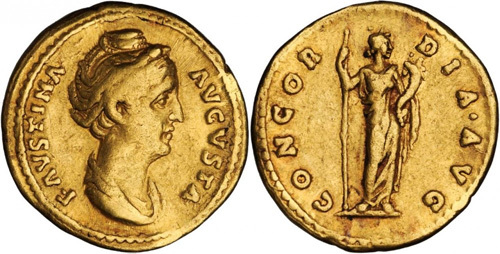 Reverse: CONCORDIA AVG, Concordia seated left, holding patera and resting left arm on chair. Obverse: FAVSTINA AVGVSTA, Bust, draped, right, hair elaborately waved in several loops round head and then drawn up and coiled on top. 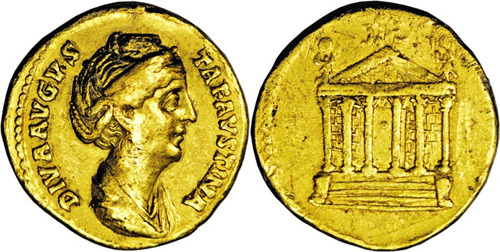 Reverse: CONCORDIA AVG, Veiled draped Concordia standing facing, head right, holding scepter and cornucopiae. Reverse: IVNONI REGINAE, Juno standing left, holding patera and sceptre, peacock at feet. Obverse: DIVA FAVSTINA, Bust, draped, right, hair elaborately waved in several loops round head and then drawn up and coiled on top. Reverse: AETERNITAS, Fortuna standing left, holding globe and rudder. Reverse: AETERNITAS, Fortuna standing left, holding patera in right hand, long rudder in left. Obverse: DIVA FAVSTINA, Bust, veiled, draped, right, hair elaborately waved in several loops round head and then drawn up and coiled on top. Obverse: DIVA AVG FAVSTINA, Bust, draped, right, hair elaborately waved in several loops round head and then drawn up and coiled on top. Obverse: DIVA AVG FAVSTINA, Bust, veiled, draped, right, hair elaborately waved in several loops round head and then drawn up and coiled on top. Reverse: AETERNITAS, Aeternitas standing left, holding globe and scepter. 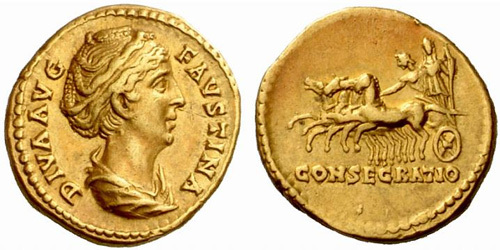 Reverse: AETERNITAS, Faustina seated left in a car drawn left by two elephants with riders on their back. Reverse: AVGVSTA, Ceres, veiled and draped, standing left, holding torch in right hand and scepter in left. 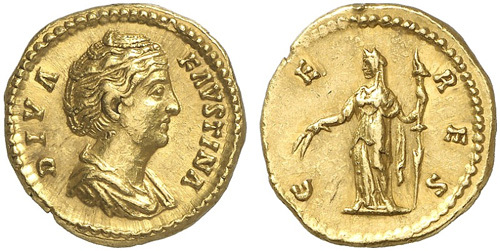 Obverse: DIVA FAVSTINA, Bust, veiled, diademed, draped, left, hair elaborately waved in several loops round head and then drawn up and coiled on top. Reverse: AVGVSTA, Ceres, veiled, standing left, holding torch in each hand. Obverse: DIVA FAVSTINA, veiled, laureate and draped bust left, wearing stephane. Reverse: AVGVSTA, Juno standing left raising right hand and holding sceptre. 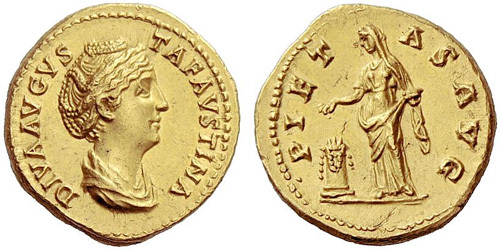 Obverse: DIVA FAVSTINA, Draped bust of Diva Faustina to right, her hair adorned with pearls and piled up on top of her head. Reverse: AVGVSTA, Diademed and draped figure of Venus to left, raising her right hand and slightly lifting her skirt with her left. Reverse: AVGVSTA, Fortuna standing left, holding patera in extended right hand, rudder set on globe in left. 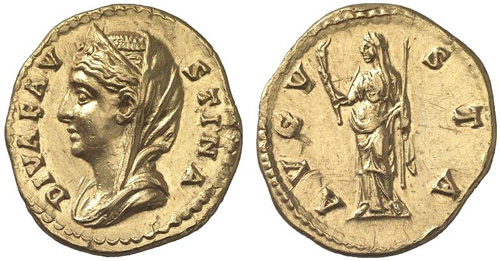 Obverse: DIVA FAVSTINA, Draped and veiled bust of Diva Faustina to right. Reverse: CERES, Ceres standing left, holding grain ears and torch. Reverse: CONSECRATIO, Faustina standing left, holding sceptre, and Sol (?) bending forward, in fast quadriga left. Reverse: CONSECRATIO, Peacock advancing to left, head turned right. Reverse: PIETAS AVG, Pietas, veiled, standing left, sacrificing over altar, holding box of perfumes. Obverse: DIVA AVG FAVSTINA, Bust, veiled and draped, right, hair elaborately waved in several loops round head and then drawn up and coiled on top. Obverse: DIVA AVGVSTA FAVSTINA, Bust, draped, right, hair elaborately waved in several loops round head and then drawn up and coiled on top. Obverse: DIVA AVGVSTA FAVSTINA, Draped and veiled bust with diadem to left. Reverse: PIETAS AVG, Pietas, veiled, standing left, sacrificing over candelabrum holding box of perfumes. Reverse: No legend, six-columned temple of Diva Faustina on podium of six steps, wall of stone blocks with door in middle visible behind the columns; in pediment tall standing figure holding scepter, between two smaller standing figures, indeterminate fish-like objects in corners; above corners of pediment two statues of Victory holding shields above their heads, facing quadriga at its apex. Obverse: DIVA AVGVSTA FAVSTINA, Bust, veiled and draped, right, hair elaborately waved in several loops round head and then drawn up and coiled on top.